For about a decade, I have been following the story of one of nature’s oldest mother birds. I’ll share it with you for my Easter 2016 post. Photo by U.S. Fish & Wildlife Service Wisdom is shown with a chick born in 2011. Mother and chick survived a powerful tsunami that claimed the lives of other albatrosses, both adults and chicks. 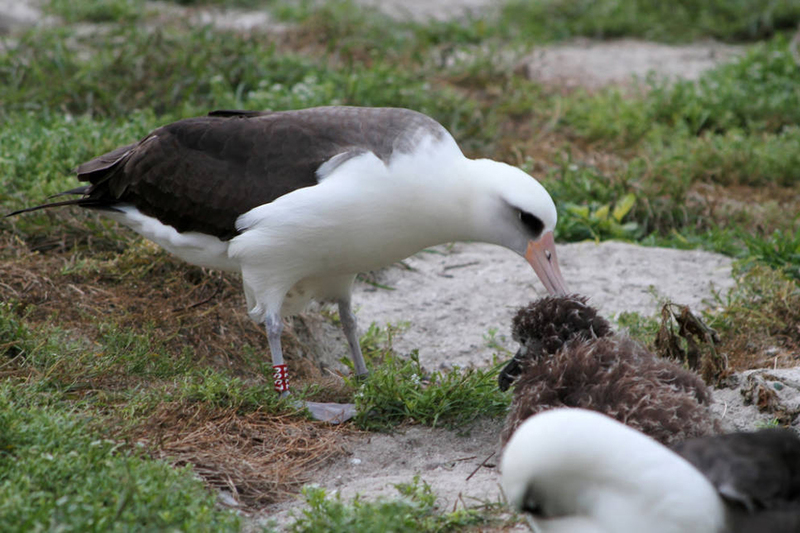 The oldest known breeding bird in the wild, a Laysan albatross named Wisdom – she’s at least 65 years old – became a mother again last month. Wisdom lives with her mate, Akeakamai, at Midway Atoll National Wildlife Refuge, part of Papahanaumokuakea Marine National Monument. The chick was observed still coming out of its shell on February 1, 2016, and days later was named Kukini, which is a Hawaiian word for messenger. Wisdom’s mate had been on the nest since Jan. 20 when he took over incubation duties while Wisdom headed out to sea. Wisdom returned just as the Super Bowl ended with her belly full. Shortly after Wisdom’s return, Wisdom’s mate was on the march towards the shoreline and immediately took flight in search of food. “Wisdom is an iconic symbol of inspiration and hope,” noted Refuge Manager Robert Peyton in a press release on the subject of the hatching of Wisdom’s latest chick. Peyton explained that from a scientific perspective, albatrosses are a critical indicator species for the world’s oceans that sustain millions of human beings as well. In the case of Wisdom, she is breaking longevity records of previously banded birds by at least a decade. Photo by David Patte/U.S. Fish & Wildlife Service Midway Atoll National Wildlife Refuge is home to the largest colony of albatrosses in the world. 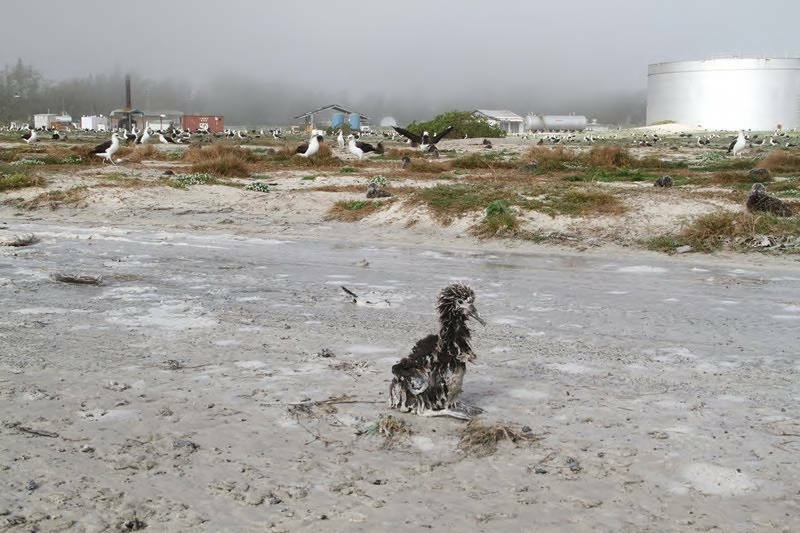 “With over a million albatrosses on Midway Atoll alone, this shows just how much is left to learn about the natural world around us,” Peyton said. The story of this amazing bird is even more astonishing given her maternal success. Wisdom has raised at least eight chicks since 2006, and as many as 40 in her lifetime. Just as astounding, she has likely flown over three million miles since she was first tagged on Midway Atoll in 1956. To put things in perspective, consider this statement by Bruce Peterjohn, Chief of the Patuxent Wildlife Research Center’s National Bird Banding Laboratory. “That is up to six trips from the Earth to the Moon and back again,” he noted “What is also miraculous is that biologist Chandler Robbins, who banded her as a breeding adult in 1956 on Midway Atoll, sighted her 46 years later near the same nesting location.” Today, at the age of 97, Robbins still comes to work on occasion doing what he loves to do. Wisdom’s chick is not the only bird in town. Albatrosses arrive on Midway Atoll in late November by the hundreds of thousands. In December U.S. Fish and Wildlife Service volunteers counted 470,000 active nests across the entire atoll – since each nest represents two adults, the total breeding population at Midway is 940,000. A low estimate of Midway’s overall population, this number doesn’t account for the non-breeders present in the colony, resting, searching for a mate, and practicing their mating dance skills. Wisdom has nested since the late 1950s on Midway’s Eastern Island behind Bravo Barracks. She was banded as a nesting adult in the same location by Robbins in December 1956. Robbins estimated that she was a minimum of five years old at the time. Another albatross — a Northern Royal Albatross that lived on the South Island of New Zealand and was named “Grandma” — reached a banded age of 51.5 years and probable actual age of 61 years or more. Wisdom and her mate have successfully fledged a chick annually in recent years. She is the world’s oldest Laysan albatross. If human, she would be approaching senior citizen status today. Photo by Pete Leary/U.S. Fish & Wildlife Service Both adults and chicks got stuck in debris and had to be rescued in the wake of the huge tsunami that washed over the island back in 2011. Wisdom, as well as her chick, survived the same tsunami that laid waste to much of Japan on March 10, 2011. FWS released an official announcement five days after the natural catastrophe stating that surveys of the three islands revealed that more than 110,000 albatross chicks – about 22 percent of that year’s albatross production – were lost as a result of the tsunami and two severe winter storms that hit in January and February. At least 2,000 adults also died. Even through such setbacks, Wisdom has thrived. She is one very special creature. FWS personnel who have worked on these islands to monitor albatross and other bird populations cherish her, and not only because she has provided valuable information about the longevity of these majestic birds. Wisdom weighs only eight pounds, but she has been producing chicks to increase the population of her kind for half a century. Photo by Pete Leary/U.S. Fish & Wildlife Service This fortunate Laysan albatross chick survived the tsunami that surged over the island back in 2011. The Laysan Albatross, Phoebastria immutabilis, is a large seabird that ranges across the North Pacific. Compared to other relatives in the albatross family, the Laysan Albatross is a small bird. It is the second most common seabird in the Hawaiian Islands, with an estimated population of 2.5 million birds. Although numbers are thought to be increasing, the Laysan Albatross has not recovered from extensive hunting that drastically reduced the population in the early 1900s. This entry was posted in Albatross, Birding, Birds, Laysan albatross, Uncategorized, Wisdom the Laysan Albatross and tagged Birding, birds, Bristol Herald Courier, Bryan Stevens, Carter County Compass, Elizabethton Star, Erwin Record, Feathered Friends, Our Fine Feathered Friends on March 27, 2016 by Bryan Stevens.